Global Health Scholars Participate in the Polar Plunge! Dr. Lisa Adams and five global health scholars participated in the annual Polar Plunge into Occom Pond on February 7, 2014 to raise funds for the Geisel School of Medicine Center for Health Equity. 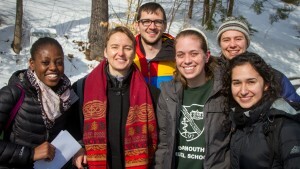 The official press release can be found here – http://32hours.dartmouth.edu/featured/photo/0103/Polar-Plunge-2014.